Nishinoshima is the second largest island in the Oki Islands Region, located approximately 65km north-east of Shimane Peninsula. The Oki Islands consist of approximately 180 islands. Four of these (Dōgo, Dōzen - Nishinoshima, Nakanoshima, Chiburijima) are inhabited. Interesting island geology has been created over hundreds of millions of years. The unique ecosystem and human life then evolved on this land. The connections between land, nature and people are a major reason behind the Oki Islands becoming a member of the Global Geoparks Network. One important component of a Global Geopark is unique geohistory. The three Oki-Dōzen Islands that you see now were once one large land mass (island). Repeated volcanic eruptions occurred. Lava spewed out from the island and the center part became empty and sunk. Seawater flowed into the sunken crater (after the last ice age) and formed an inner sea and three islands. Sightseeing buses, taxis, rental cars…and even rental bicycles! 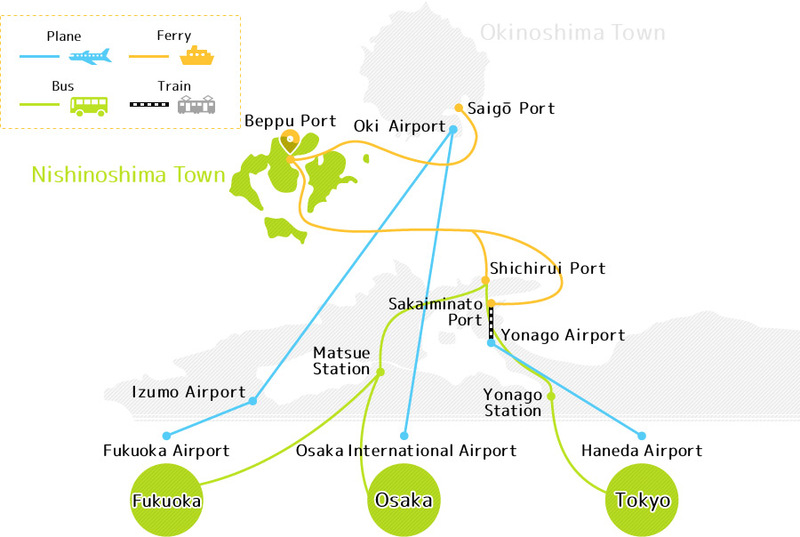 Talk to the information center (Nishinoshima Tourism Association) and find the best way for you to move around the island! Business Hours: 8:30 - 17:30(Weekday), 9:00 - 17:00(Saturday, Sunday, Public Holiday)※ Small cars only.